This silver cross necklace is easy-to-wear for everyday or as a necklace or gift for a special occasion. Personalised with a hand-stamped sterling silver initial tag. The letter can patinised so it stands out (black finish) or it can be left silver (clean finish). 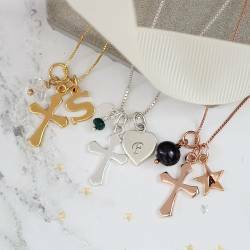 Beautiful and elegant, it makes a thoughtful and treasured gift for Godparents at a Christening, or as a keepsake gift for children on their Christening. Alternatively, it’s a lovely birthday or Christmas gift.